homify 360° is your go-to source for noteworthy architectural creations worldwide. Our latest and greatest discovery presents not only fascinating layouts, but also an abundance of that timeless and age-old material that architects and designers can’t seem to get enough of – wood. 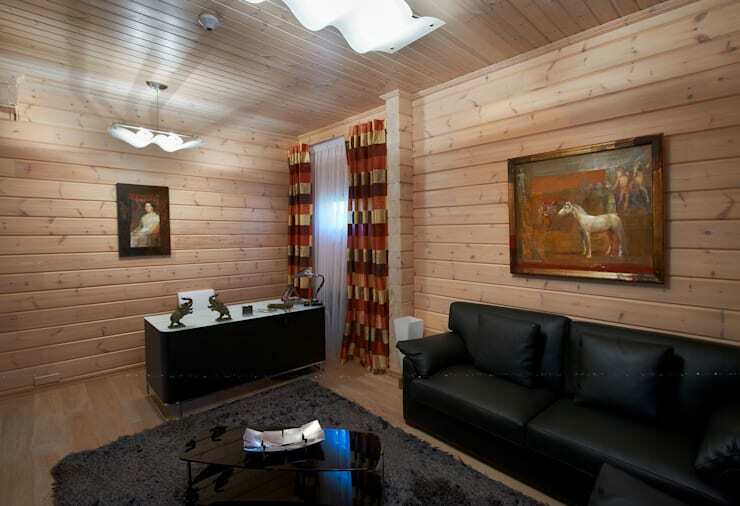 Wooden houses exert a special fascination, not the least of which is because of their cosy atmospheres. In addition, they also radiate a certain elegance, as well as a unique closeness with nature. German architectural firm Woody-Holzhaus most definitely approves of this raw material, since it plays such a prominent part in all their creations. 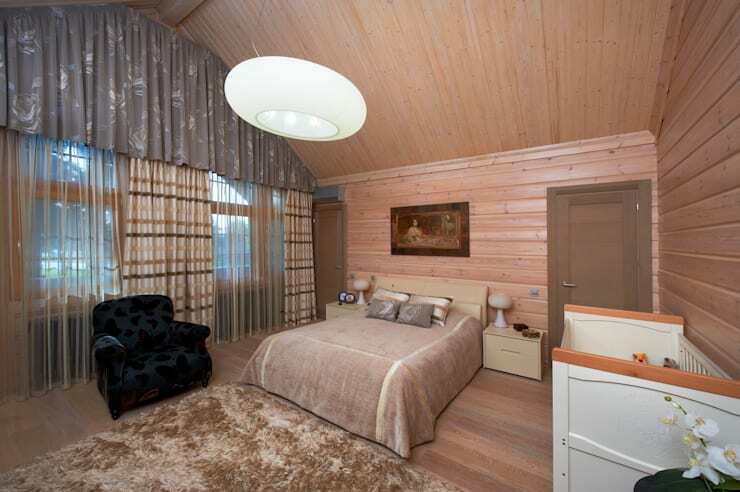 Join us for a getaway to a classy wooden chalet that is charming, luxurious, and decidedly unforgettable. A most striking view that is certainly rivalled by few creations – that is what the façade portrays. Its form is reminiscent of the traditional American cottage, including that charming porch that is perfect for afternoon tea. 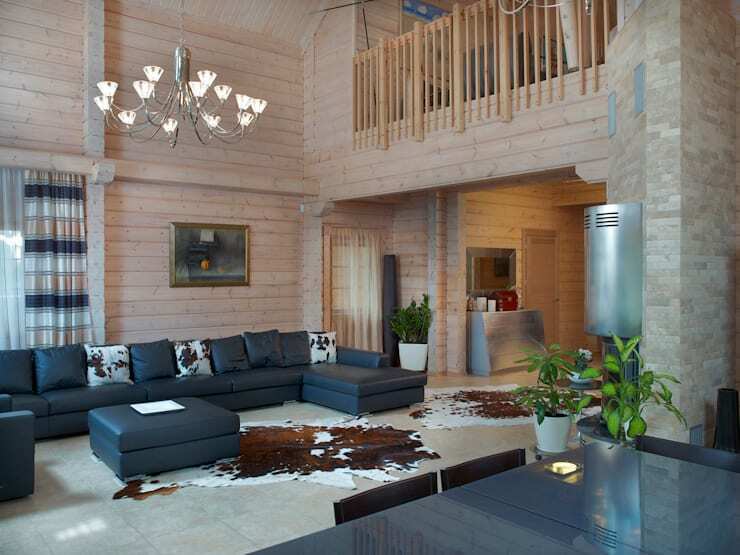 Polar pine was used for the house, chosen for its particularly dense structure. This wood is thriving in northern Finland, where it does a premium job of keeping the locals warm and cosy in the frosty climates. Notice the sublime contrast caused by adding that fresh green grass and blue sky to the honey-toned timber. 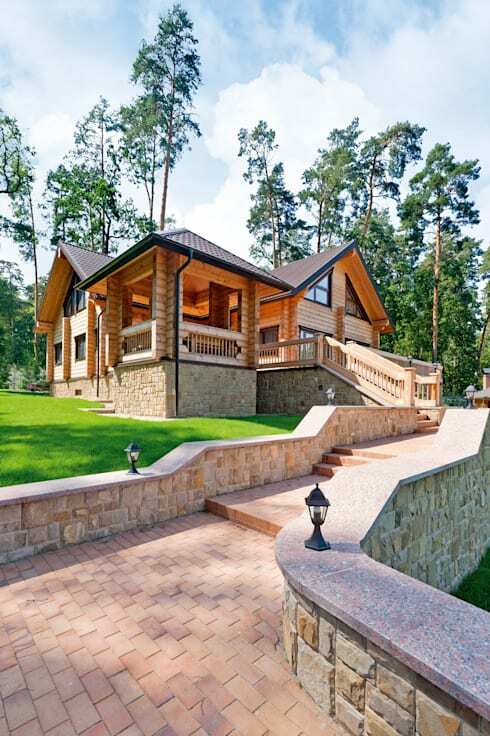 What would a charming wooden chalet be without a scenic garden path to accompany it? Stone and brick form an enchanting combination, and culminate in a remarkable little pathway that makes one conjure up images of a mini Wall of China. But don’t believe for one second that this house is all bark and no bite. 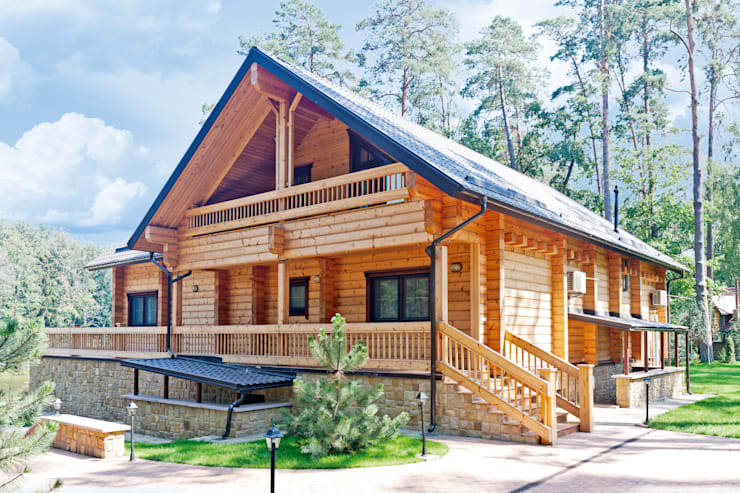 Thanks to modern sealing methods, this chalet is very energy efficient. 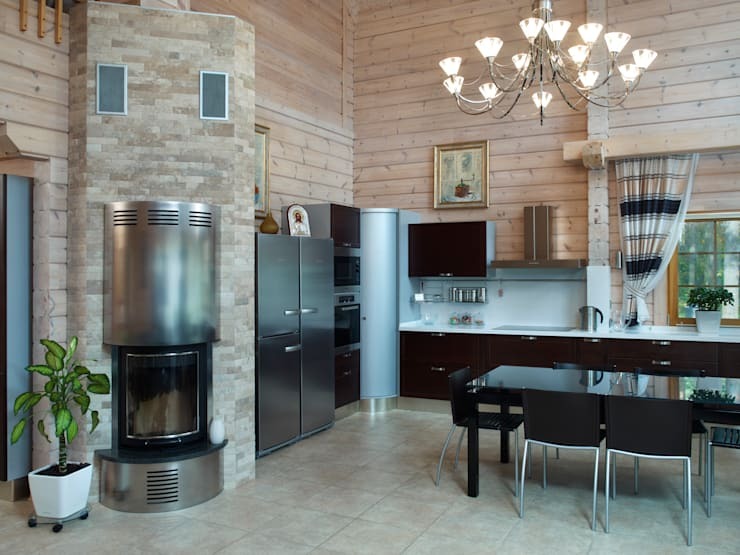 Double insulation mechanisms were used throughout, ensuring a snug interior atmosphere during the coldest temperatures. Once inside, it is clear that wood isn't only the exterior star of the show. Yet the interior presents quite a handful of high-quality contenders. A fabulous black leather sofa stands out strikingly against the light wooden wall. This dark tone also shows up in the dining table, as well as certain décor elements. To add practicality to the house’s list of cons, the designers used high-quality timber that does not emit chemical gases or dangerous air particles. In addition, its block beam construction ensures a constant indoor humidity level, especially in the huge living room area, which shares its open floor-plan with the dining room and kitchen. On to the kitchen/dining area, where some aluminium and steel come into play. This brilliant combination of materials make up an elegant corner, perfect for culinary preparation (notice the beautiful link between the wooden panelling and that sandstone coating of the fireplace wall). And since it’s an open plan, we have ideal legroom for guests to keep that hard-working cook company, as they either take a lounge on that fantastic black couch, or engage in some good-natured jabbering at the dining table. With homify’s stunning collection of kitchens, you’ll be spoiled for choice when it comes to inspiration for your culinary hot spots. Making this house more unique is the owners’ collection of artwork. With warm autumn colours and rustic-like frames, the paintings add personal touches to the charm and elegance that is already present in all the rooms. And what better spot to show off these personal touches than the upstairs living room? This area is a continuation of the downstairs social area, albeit in a more compact and comfy form. A corner workstation was added here, making up an informal little office for anybody needing to demolish some deadlines in peace and quiet, while the rest of the residents are living it up downstairs. And with a fluffy carpet like that, one will have no choice but to get out of bed on the right foot! In case you need another escape to luxury, feel free to flee to: The Perfect Countryside Getaway.